RXDC, the ultimate high-frequency X-ray unit designed by MyRay, exploits the very latest technology with a view to providing the best solution to each and every requirement in the field of intraoral radiography. Focus on flexibility and multifunctional settings, combined with top quality imaging, make RXDC a highly versatile and reliable X-ray unit, offering precision diagnostic potential. Specifically conceived for digital X-ray imaging, the constant potential tube head combined with the smallest focal spot available for intraoral imaging (0.4 mm) guarantees consistently sharp images. RXDC features HyperSphere technology. The full-swivel ball-joint is revolutionary in every sense. The tube head revolves freely around the sphere, so that practically any position can be achieved, including complete vertical. An automatic touch-sensitive lock-on/lock-off device enables effortless repositioning of the tube head between exposures. RXDC is equipped with an 8” X-ray collimator entirely integrated into the tube head body. This makes the tube head itself a more compact lightweight component than would otherwise be possible. 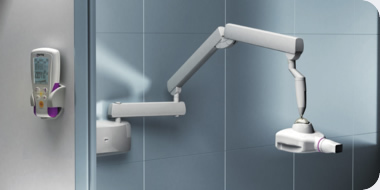 The unique tube head design, together with the stable aluminium arms, make this unit effortless to manoeuvre. RXDC is supplied with a standard rectangular cone which extends just 4” beyond the tube head body, resulting in a 12” long rectangular collimation. The operator is free to remove and replace the rectangular cone extension. This triggers an automatic preset of exposure times which are displayed on the handheld control device. There is no need to re-program before acquisition. RXDC, with its constant potential high frequency X-ray generator, significantly reduces radiation dosage compared to traditional X-ray units. Not only is the most harmful, low-energy radiation almost completely eliminated thanks to the high-efficiency generator, but the embedded 12” rectangular collimator minimizes the exposed bodily surface and increases the X-ray parallelism. This leads to better image quality and higher regard for patient’s health. 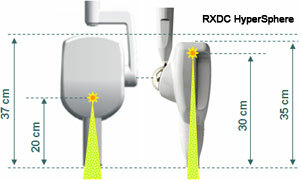 The RXDC is supplied with a portable wireless digital control device that can be installed anywhere in the dental studio. There are no other wall-mounted or wired control panels to worry about. Easy-to-use and easy-to-handle, the control device offers a full range of intuitive exposure scenarios designed to make correct X-ray acquisition a straightforward process. No more complex programming or button-crowded panels. RXDC defines automatically the correct exposure by selecting the region of interest.